Recently a number of commentators on the weekly business shows have commented oil prices and the stock market have been moving in the same direction during the month of January. On the few days oil and stocks moved in opposite directions, the conclusion was this would be a good thing for the overall market. Not wanting to single out any one specfic strategist, but this past Monday, Bill Stone, chief investment strategist at PNC Wealth Management, noted on CNBC, "it's not clear whether the selling will subside for now because of the tight correlation between stocks and oil prices, which he says should break at some point (emphasis added)." This comment is similar to a number of other strategists. So what is the point then? 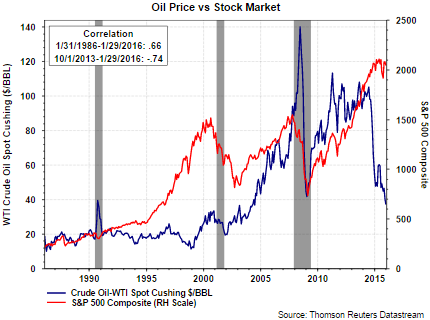 As the below chart shows, going back to the mid 1980's the price of oil and the price of stocks have a positive correlation of .66. It only has been since October of 2013 that this correlation broke down and reversed. Since the October 2013 time period, the correlation between oil prices and stock prices has been a negative .74. In other words, market participants should be rooting for higher oil prices and a return to the positive correlation that has been evident over the long run. In all seriousness though, investors should be aware of the fact that there is a high positive correlation between oil and stock price movements. A number of factors can influence the price of oil, but stronger demand in an environment of stable supply can cause oil prices to rise. This often occurs when stronger economic activity is present. What seems to be occurring today is lower oil prices face downward pressure due to the continued increase in supply in spite of a significant reduction in drilling rig count. The first chart below shows global demand has continued to increase; however, supply growth is greater than the growth in demand. The supply/demand imbalance does not come into balance until late 2016. 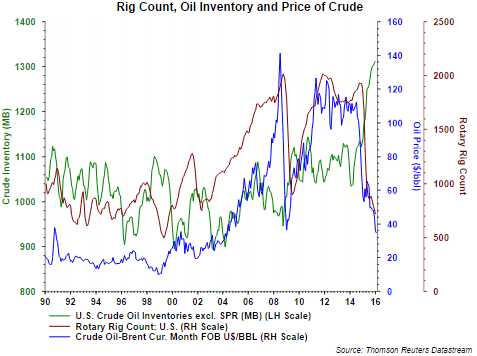 The second chart shows rig count (maroon line) has declined by more than 60%, i.e., 1,216 rigs, yet supply (green line) has continued to grow. In conclusion, we believe the recent disconnect in the movement between stock and oil prices is influenced more by excess supply and not a decline in demand. The positive to draw from this one data point is economic activity is not contracting if one evaluates the oil consumption part of the economy. If lower oil prices continue to be realized, at least in the first half of this year, this should be a tailwind that supports consumer spending in other areas besides energy and supports steady economic growth this year. Two Fridays ago (1/15/2016) I highlighted sentiment readings often associated with an oversold equity market. 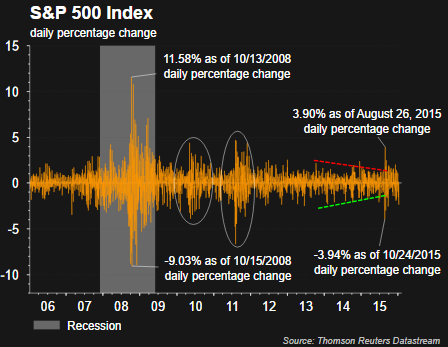 Two days later, Wednesday of this past week, the S&P 500 index bottomed and staged a turnaround, generating its first weekly gain of the year, up 1.4%. A number of the sentiment measures improved with this turnaround, yet two positive return days does not qualify as a new bull market. Below is a table consisting of a number of sentiment indicators comparing readings from two weeks ago to the just concluded week. The equity put/call ratio, the Vix and the Vix/10-year Treasury Yield ratio improved. Although improvement was seen in the P/C ratio, the 21-day moving average of the ratio moved higher to .79 versus last week's average level of .76 as can be seen in the below chart. A sustained move lower in this average is associated with increasing equity prices. With the elevated level of this average, a turn lower is a high probability. 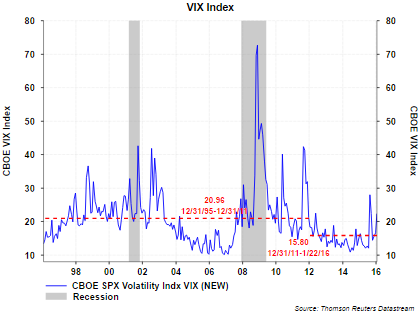 One recent concern for investors is the spike in volatility experienced by the market. 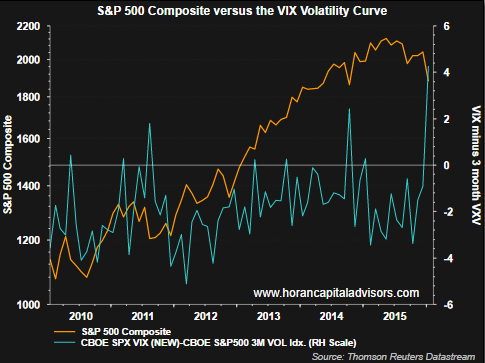 A part of the heightened awareness has been the lack of downside volatility from 2011 until the August 2015 correction. Since 2011 the Vix index has traded at a lower average level of 15.80 compared to the time period from 1995-2011 when the average was 20.96. 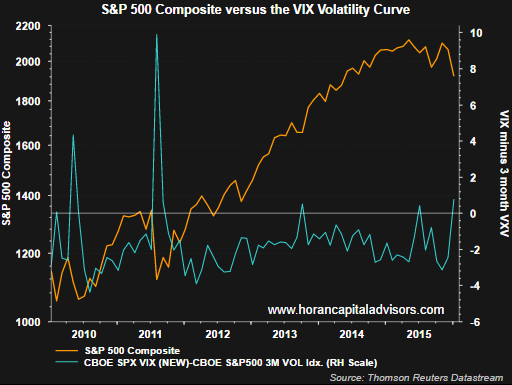 As noted in several earlier blog posts, the Vix index is a measure of implied equity volatility. Higher levels in the Vix imply a higher level of market uncertainty or fear. In an effort to compare the Vix to economic expectations, one can evaluate the Vix divided by the 10-year Treasury Yield. A number of factors can influence Treasury yields, but the perception is lower yields on longer term Treasuries are reflective of a weaker economic environment. As a result, one would want to see a lower Vix to 10-year ratio. As the table above noted, this ratio has declined over the last week. Of importance is the fact this ratio has traded at a higher average level since 2011 at 7.49 versus 5.34 from 1995-2011. As can be seen in the Vix only chart above, the Vix has traded at a lower level since 2011. 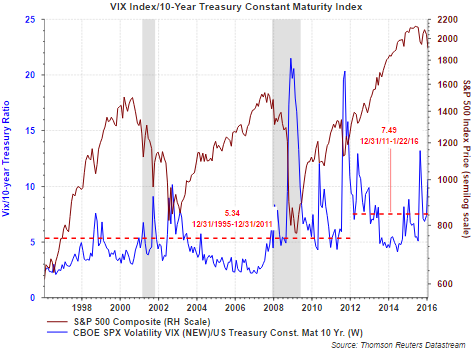 Consequently, the Vix/10 year ratio has been higher due to the lower level of the 10-year Treasury, indicating the market has been expecting a weaker economic environment. And the economy has been growing below its long term potential. Lastly, the NAAIM Exposure Index is trading at a level notable for oversold markets. 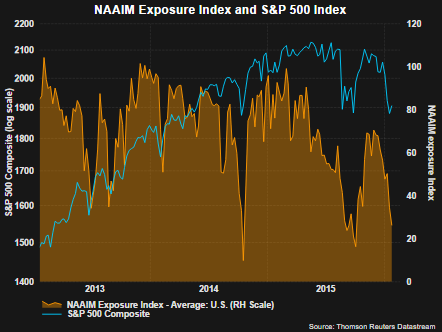 The NAAIM Exposure Index consist of a weekly survey of NAAIM member firms who are active money managers and provide a number which represents their overall equity exposure at the market close on a specific day of the week, currently Wednesdays. Responses are tallied and averaged to provide the average long (or short) position or all NAAIM managers, as a group. This lower equity volatility translated into the market moving higher nearly unabated since 2011. August 2015 rolls around and breaks the nearly four year streak without a greater than 10% correction as the market fell 12.4%. A market recovery took hold into year end and another correction unfolded this month. For a number of reasons I expect the equity market to experience higher volatility going forward. The core of the Federal Reserve's quantitative easing programs has ended and the Fed has embarked on a tightening program with December's rate increase, and this is likely to cause increased market volatility, but not all to the downside. The issues impacting the energy market are also negatively weighing on the market and investor sentiment. A difference between 2008/2009 and now is the fact the 08/09 issues were related to housing and ultimately negatively impacted the consumer. With the issues facing the energy sector, the outcome has been lower oil prices and this serves as a broad benefit for consumers. As Charles Schwab recently noted in a report, it would also be the first time a sharp decline in oil prices led to a recession. The coming week will contain potentially market moving news. The Fed has a meeting scheduled with an announcement on Wednesday, the first estimate of fourth quarter GDP is reported on Friday and 44 companies report earnings this week. A number of energy, materials and industrial firms are included in the 44 announcements and the market will look to guidance for insight into potential economic growth ahead. Earlier this week Consuelo Mack of WealthTrack conducted Part II of her interview (Part I highlighted last week) with legendary economist Ed Hyman, Chairman of Evercore ISI, and Dennis Stattman, fund manager on BlackRock's Global Allocation Fund. This interview occurred after the market weakness experienced during the first week of January so both guests were aware of the early year market contraction. Ed Hyman believes the global issues facing economies are a result of growing too slowly and attributes this to the slowdown in China. This below potential growth rate leads to potential deflation and he cites the issues within the commodity sectors. His favored international market is Europe, but does acknowledge the benefits taking place in Japan after nearly 25 years of no growth in that country. He does believe China is the key for the broader emerging market arena and does think China's economic policies are moving in the right direction, i.e., getting growth in consumer demand and moving away from fixed asset investment. He cites good China sales data from Apple and Alibaba. His biggest worry is the issues in the Middle East as a result of the decline in oil prices and the negative impact this has on revenues for those countries. Dennis Stattman is a pound the table bull on Japan. He notes that earnings growth and dividend growth for Japanese firms has left price earnings ratios for Japanese companies nearly unchanged. He cites Japan is the only major area where earnings revisions are positive. He does worry about the debt growth in China and the slowing of GDP growth in the country. Dennis' biggest worry is China experiences a large decline in tts currency and that adjustment negatively impacts other emerging markets. He believes a world of quantitative easing, asset prices in the QE countries inflate and economies do benefit. Hedging the currency exposure is an important factor for individuals investing in Japan though. As with the Part I interview, this is a worthwhile viewing for readers. To say the least it has not been a rewarding start for investors in the equity markets so far in 2016. After the volatile downside move in equities today, the S&P 500 Index closed at 1,880, down 8% year to date. Intraday today the S&P 500 Index was down 3.3% and pierced the August low of 1,867 and finally closed down 2.1%. The market action has raised the investor fear level to near oversold levels, if not to a maximum oversold level. 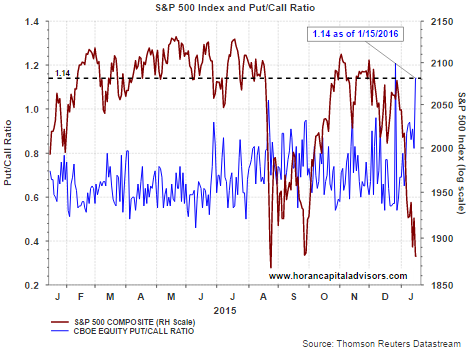 The equity put/call (P/C) ratio spiked above 1.0 to 1.14. As I have noted in earlier posts, P/C ratios above 1.0 are representative of an oversold market. 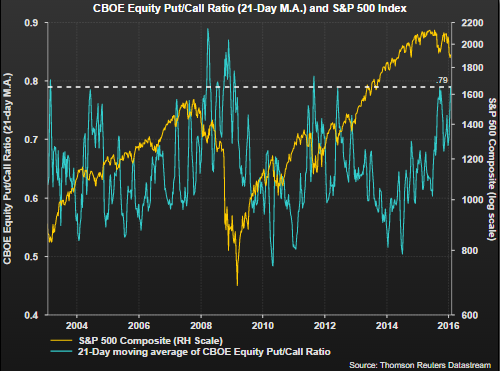 The equity P/C ratio tends to measure the sentiment of the individual investor by dividing put volume by call volume. At the extremes, this particular measure is a contrarian one; hence, P/C ratios above 1.0 signal overly bearish sentiment by the individual investor. A week ago I wrote about the VIX futures curve being in backwardation. Steeper backwardation has occurred after the market action today. Backwardaion took place near the market bottom on August 25, 2015. VIX backwardation is an indication traders expect volatility in the future to be lower than it is now. 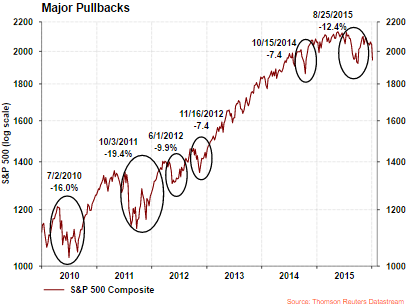 Historically, when this occurs, short term market rallies tend to result from this technical event. Further, individual investor bullish sentiment fell four percentage points to 17.9% as reported by the American Association of Individual Investors earlier this week. The last time the reading was near this level was April 14, 2005 when bullish sentiment was reported at 16.5 and the S&P 500 Index was trading at 1,173. Investor sentiment is a contrarian indicator and this level of market pessimism is another sentiment measure that may mark another interim market bottom. Scott Grannis, writer of the Calafia Beach Pundit blog and former Chief Economist at Western Asset Management, highlights other fear measures that readers may find useful in reviewing. His recent post includes commentary on the stress in the bond market and notes the higher liquidity in the markets today versus in 2008. As with most market sell offs, elevated fear levels are the fuel to the fire, yet can result in a market that becomes too oversold. On Tuesday The Royal Bank of Scotland's credit chief, Andrew Roberts, made the clarion call to 'sell everything.' He predicts a cataclysmic year faces investors in 2016. A day earlier, a J.P Morgan equity strategist advised investors to sell any rally. Investors are grappling with an increase in market volatility at the start of the New Year. After celebrating the end of a flat to mostly negative year in 2015, investors least expected the pace of the current January market pullback. As I discussed in this past weekend's post, A Difficult Beginning For The Market To Start The New Year, market swings of greater than 10% have been scarce since 2011. Essentially, the market steadily climbed higher for nearly four years until last August when the S&P 500 Index declined 12.4% from the May high. In other words, investors may have been conditioned to expect lower volatility from stock prices. In our recently published Winter 2015 Investor Letter we discuss the challenging year faced by investors in 2015. A number of notable events occurred in 2015, the market succumbed to a 10% correction after going nearly four years without one, the Federal Reserve raised interest rates for the first time in over nine years, and 2015 equity market returns were concentrated in a handful of names, those names have been referred to as the FANG stocks, Facebook, Amazon, Netflix and Google (now called Alphabet.) Our Investor Letter contains our thoughts on the coming year. These thoughts include commentary on oil, the US Dollar and recent economic activity. Ed Hyman, Chairman of Evercore ISI, and rated the number one economist for 35 consecutive years by Institutional Investor, recently sat for Part One of a two part interview with Conseulo Mack of WealthTrack, which was aired a few days ago. Also participating in the interview was Dennis Stattman, the Portfolio Manager of Blackrock Global Allocation Fund. Hyman pointed out many positives he has witnessed in his travels around the country and gleaned from Evercore ISI's business surveys. In short, Ed Hyman believes the U.S. economy is only halfway through its current expansion. He believes the consumer, employment and now broadly rising wages are some factors that continue to support slow but steady U.S. economic growth. The interview does point out his concerns as well. Dennis Stattman on the other hand, believes greater opportunities for investors can be found in non-U.S. markets. His concern is the U.S. economy and market growth have been largely supported by the Fed's quantitative easing programs. 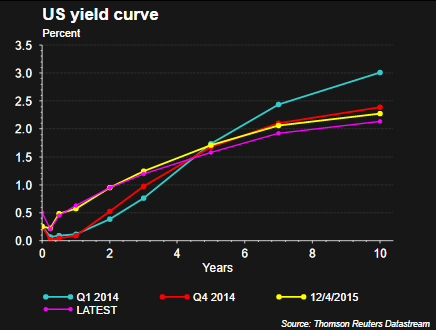 The U.S. market began to stumble last year once the Fed pulled back on its QE endeavors. Additionally, Dennis Stattman believes U.S. firms will find it difficult to grow profits in an environment where corporate profits as a percentage of GDP are at historically high levels. Dennis did not say this, but if one believes QE inflated U.S. equity prices, the European Central Bank and Bank of Japan continue to implement QE strategies. The interview runs about 30 minutes and is a worthwhile viewing for readers. I will post Part Two when available, likely next weekend. in August, the 5-day market decline was -11%. Influencing investor perceptions is the fact not many asset class categories performed well last year. Except for the FANG stocks (Facebook, Amazon, Netflix and Google (now called Alphabet)) diversifying one's investments across asset classes did not generate expected results and we commented on this in our last post of 2015. Coincident to the narrow market leadership has been the fact the S&P 500 Index has moved higher since the end of the financial crisis in a nearly uninterrupted climb. Until mid-year last year, the S&P 500 had gone nearly four years without a greater than 10% market correction. Prior to the last correction in August, two back to back sizable declines occurred in 2010 and 2011. One factor evident subsequent to 2011 was the lower volatility exhibited by the market, i.e., lower daily price swings in the market. This is seen in the chart below. The two circles on the chart mark the period around the time of the 2010 and 2011 corrections. One theme we believe will play out over the course of this year is a market that has a more normal, that is, higher level of volatility on a daily basis. The start of this year is proving this to be the case. There are several factors at play that are likely to be a catalyst for the higher level of market swings. The first and probably most significant one is the late stage of this economic expansion with our belief the economy is in the early last third of the cycle. This raises the question of how late in the cycle is the economy. 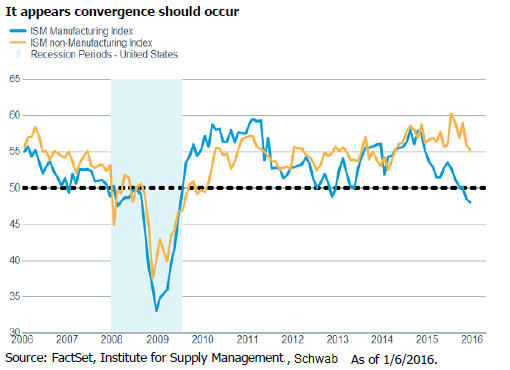 At issue is the divergence in the ISM manufacturing and non-manufacturing indexes. The ISM Manufacturing Index has fallen below 50 and is evidence of contraction in the manufacturing segment of the economy. According to the report, "contraction in new orders, production, employment and raw materials inventories accounted for the overall softness in December." In reviewing some of the respondents comments in the report, many of them referenced weakness in energy and commodities as an issue. With respect to the ISM Non-Manufacturing Index, Charles Schwab notes, "With the service sector making up roughly 88% of the U.S. economy according to HFE Research, the easy answer is that the manufacturing sector (the other 12%) will be dragged along. But the cautionary tale is that the manufacturing side of the economy in the past has been a leading indicator; so we do not have blinders on to the risk of a recession if services were to falter. But the consumer-oriented services sector does generally benefit from lower energy prices; while the hit to the energy sector would lessen if oil prices were to stabilize." We also believe the consumer is in good financial shape and will benefit from their improved balance sheets and the benefit derived from lower energy costs. The second factor is the Fed. In December the Fed increased the Fed Funds rate by .25% or 25 basis points. Historically, when the Fed embarks on a tightening cycle, the market stumbles at the first rate hike. A rate increase from this low of an interest rate level historically does not hinder economic growth. The uncertainty with this rate tightening cycle is the fact economic growth since the financial crisis has been highly supported by quantitative easing activities. Subsequent to the Fed rate increase, the yield curve has actually begun to flatten with longer term rates declining in spite of an increase in short term rates. 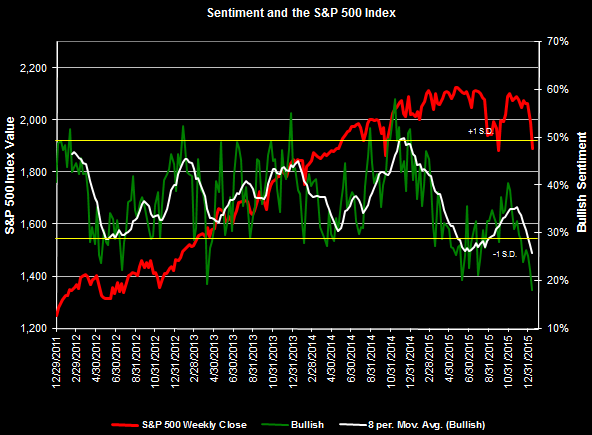 From a technical and sentiment perspective the market is certainly approaching, if not near, oversold levels. With Friday's market close, the VIX futures curve went into backwardation. This occurred near the market bottom on August 22, 2015. VIX backwardation is an indication traders expect volatility in the future to be lower than it is now. 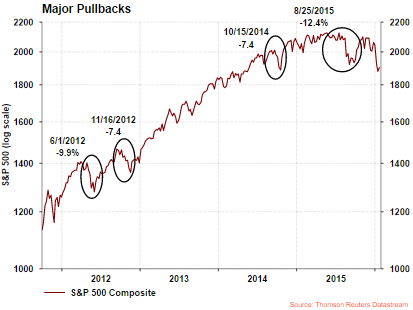 Historically, when this occurs, short term market rallies tend to result from this technical event. The American Association of Individual Investors' report last week showed, in addition to a decline in bullish sentiment to a level last reached in July 2015, the bull/bear spread came in at -16.1% versus the prior week's level of +1.5%. 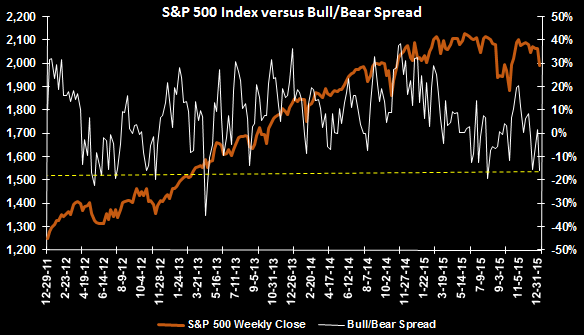 This week's reading is the most bearish the spread has been since July of 2015 as well. 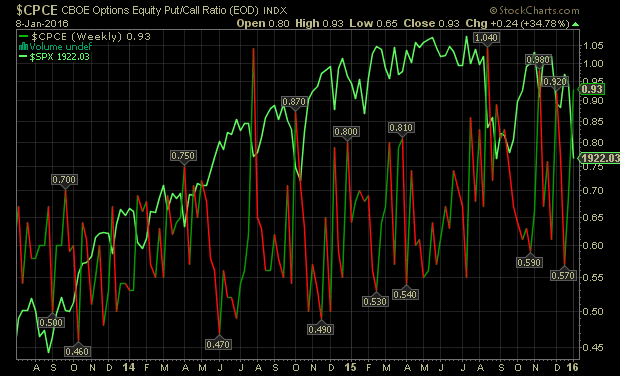 The equity put/call ratio spiked higher to .93 on Friday. This ratio measures the sentiment of investors by dividing put volume by call volume. At the extremes, this particular measure is a contrarian one; hence, P/C ratios above 1.0 signal overly bearish sentiment by investors. Levels above 1.0 are most associated with an oversold equity market. 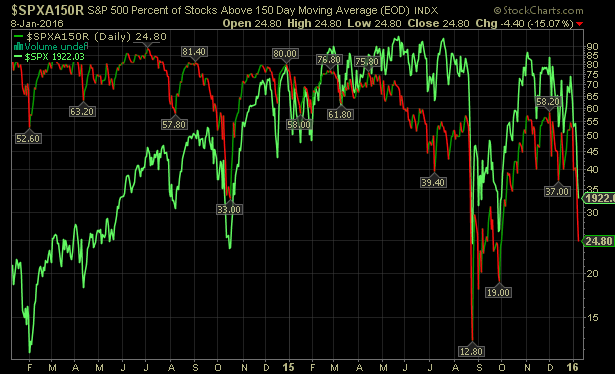 The next two charts show the percentage of S&P 500 stocks trading above their 50 and 200 day moving averages. Both charts show the low percentages occur near market levels which have historically been indicative of market bottoms. Lastly, a look at the market itself. 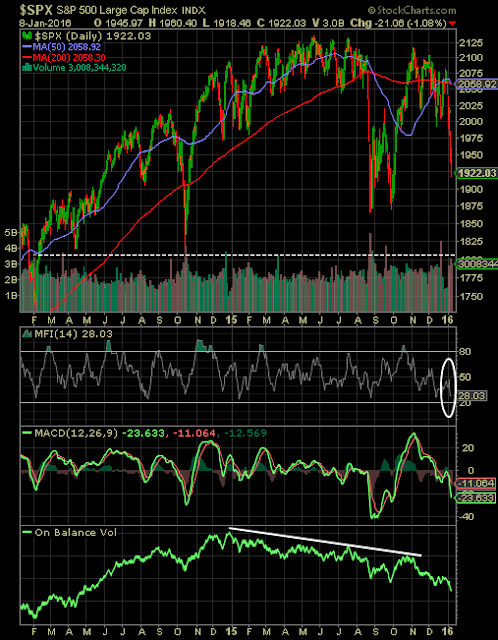 In addition to the above noted technical and sentiment indicators, the below chart shows the market is nearing an oversold level. The technical money flow index (MFI) is nearing the oversold level, less than 20. The caveat is strong market downtrends can result in the MFI remaining below 20 for an extended period of time. The current MFI level is near the level reached at the August market low. On the other hand, both the MACD and On Balance Volume indicators are not indicating a market ready to bounce. For a number of other reasons also, but these two indicators may indicate the market retests the low reached in August, i.e., S&P 500 Index level 1,867. As noted at the outset of this post, to reach the August low, the market would need to decline only 55 points or 2.8% from Friday's close. In summary, Burt White, Chief Investment Officer at LPL Research, provided good commentary for investors as they navigate this market environment. "Risks remain, however, as continued declines in energy prices have delayed vital capital investment by a major segment of the U.S. economy, corporate earnings remain muted, and manufacturing remains weighed down by tepid global demand and a stronger dollar. Although the turmoil in the oil markets remains a top concern, the lower prices should help speed up the painful supply adjustment process and may bring about greater stability as the year unfolds. 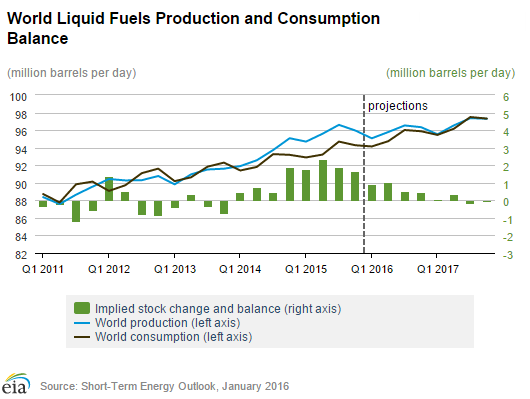 Should the supply-demand imbalance in energy stabilize as we expect, this could be a potential catalyst for additional capital spending and accelerated profit growth as 2016 progresses." "Volatility has always been a part of investing and always will be. In fact, over the last 15 years, every calendar year has seen at least one pullback of at least 6% and a median correction of 14%. So while volatility is normal (and even expected), it is always nerve-wracking. These short-term market flare-ups are often quick and severe, but fueled by feelings of fear and concern over perceived risks that may not be actual threats. We expect volatility to remain heightened for the remainder of 2016, which is common as the business cycle ages, and in turn, makes sticking to your long-term investment plans even more important to avoid locking in losses and missing out on opportunities. This current pullback...could continue over the short term as fear and concern trump much of the good news coming from the U.S. economy. What remains as the key to weathering these short-term bouts of volatility is a commitment to a well-formulated plan, a long-term focus, and good headphones to tune out the noise of short-term negativity." 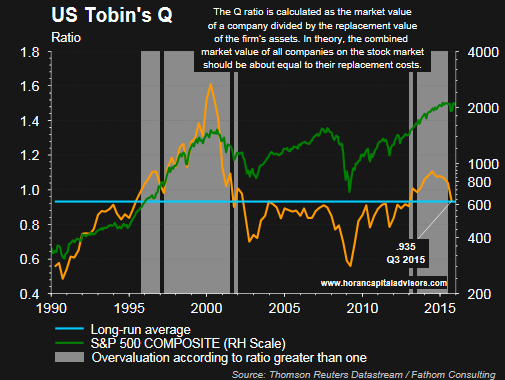 As of the third quarter the Tobin's Q ratio declined below 1.0. The Tobin Q ratio was originally formulated by Yale University professor James Tobin. James Tobin is a Nobel laureate in economics. The theory behind the ratio is the combined market value of companies on the stock market should be equal to the replacement cost of company assets. The Q ratio is defined as the ratio of the market value of a firm to the replacement cost of its assets. When the stock market trades at a ‘discount’ to the replacement cost of its assets, the market is inexpensive. This discount is when the ratio is below 1.0. When the ratio is above 1.0, the market trades at a premium to its replacement cost. 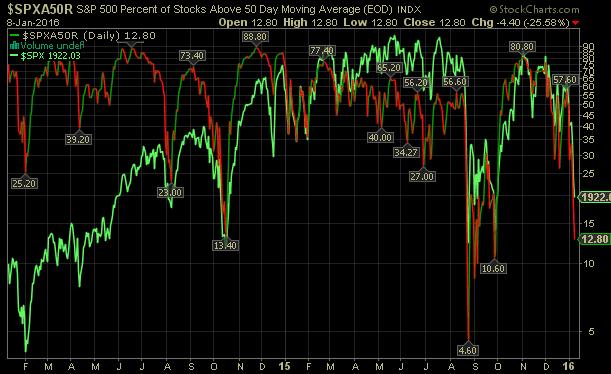 As the below chart shows, this reading below 1.0 is the first since the Q ratio equaled .986 at the end of Q2 2013. Since 1990 the average Q ratio level is .94, but certainly skewed by the high Q reached at the height of the technology bubble in 2000. Going back to 1950, the long run average Q ratio is approximately .70. The Tobin Q ratio is not a short term timing indicator; however, it does allow one to evaluate over and undervaluation of the market. In terms of expected returns, the below chart shows future 10-year forward returns at various Q levels. 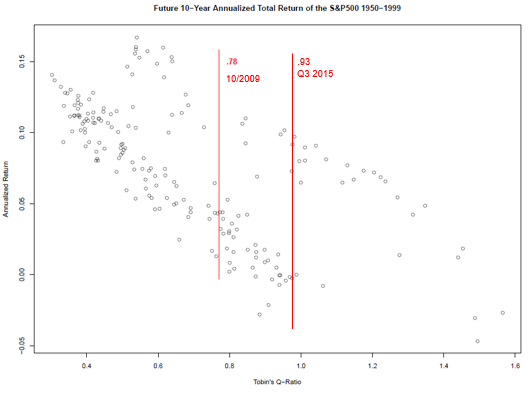 Evident from the chart is lower Q levels are associated with better forward returns. "A Tobin's Q of more than one means that the market value of assets (as reflected in share prices) is greater than their replacement cost. This means it is likely that capex will create wealth for shareholders. This means companies should increase capex, raising more money to do so if necessary, but should not make acquisitions. This should reduce share prices and increase asset prices, pushing Q towards one." "A Tobin's Q of less than one suggests that the market value of the assets is less than replacement cost, making acquisitions cheaper than capex; buying cheaper than setting up from scratch. This should increase share prices and reduce asset prices, again pushing Q towards one."